Today is the first day of my visit to the beautiful island of St. Eustatius in the Dutch Caribbean (also known as Statia). I am extremely excited as this has been on my personal list for a while and I am finally here! However the vacation memories actually began yesterday. Some of the Caribbean’s most beautiful islands and pristine diving are this way at least in part due to the fact that they are not the easiest to get to. For example while my personal itinerary only entailed 5 ½ hours of flying, my travel time was 13 hours thanks to two plane changes, one with a 4 hours stopover. As a frequent traveler I have an airport club membership and I use it and abuse it often on my travels, however today was different. With family and friends in tow, I skipped the comfort and amenities of the club and grabbed a bite surrounded by the sights and sounds of Miami Airport. This is not my favorite connecting city by a long shot but with the recent additions of a number of resturants, the dining options were plentiful and the two hours painless enough. MIA’s typical hustle and bustle was enhanced by various small demonstrations of the “Best of Brazil” here and there throughout the airport to celebrate the kick off to the World Cup which was loud but fun to watch. 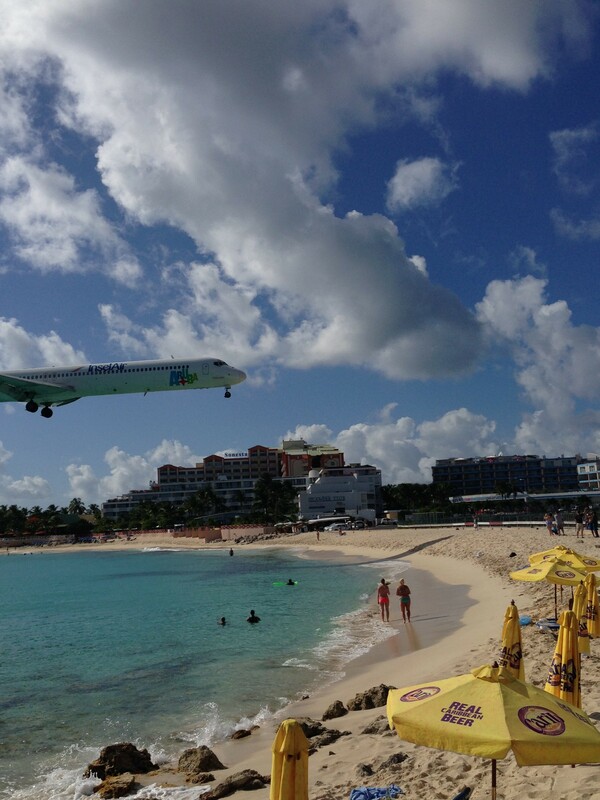 After a short 2 ½ hour flight to St. Maarten, we were now faced with a 4 hour layover before our island hop over to Statia. Customs and Immigration was painless despite this being a hub for the Caribbean and we were through the connecting flight line ready to check-in with Win-Air by 3pm. The counter here was small and at first short-staffed, but after about 10 minutes, help arrived in the form of a second agent and by 330pm we had boarding passes in hand, bags rechecked and lots of time to kill. Regardless of whether we stayed in the airport or left, we had to go back through security, we figured we had nothing to lose by leaving. However it is not recommended with 3 hours between flights to go too far from the airport. While you can certainly ride to and sight-see various places in that time with a taxi tour, the traffic can be quite heavy around Philipsburg and you can experience an hour or more delays just trying to get back. We played it safe and paid $4USD per person for a quick ride over to Sunset Beach. It is a bit of a tourist trap but I personally feel that sometimes they can still have something to offer and are on the map for good reason, even if they in no way shape or form represent the true attributes of a destination. While filled with mainly young and loud American and Western European people getting their drink on, Sunset Beach Bar offered an eclectic mix of all kinds of people and provided a fun way to kick off your vacation far more so than any airport watering hole. 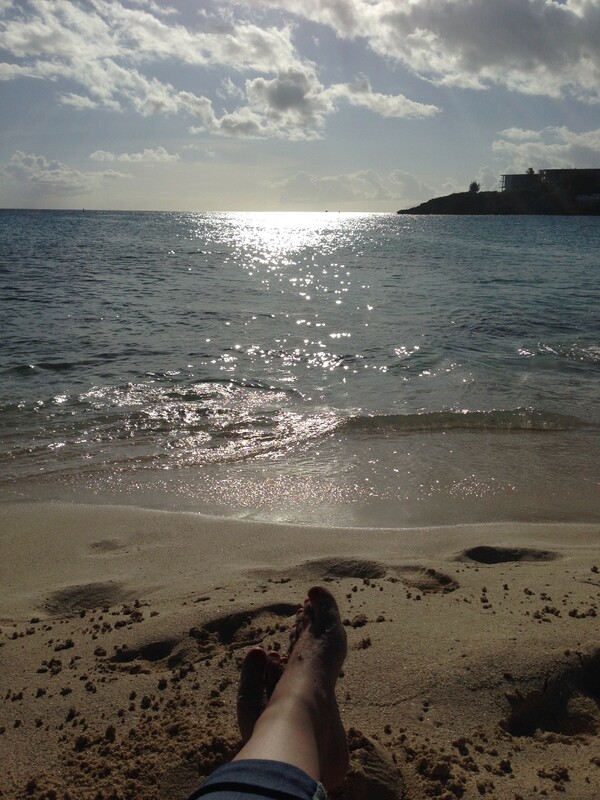 By 4pm, food was ordered, frozen drink was in hand and toes were caressing the soft white sugary sand while soaking up the sun and the sounds and smell of the ocean. Not much time passed before my belly was full and with second beverage being worked on, I felt my body finally relax and officially begin to enter vacation mode. Being a “when in Rome” type of girl, and now firmly on holiday, I decided to join in the revelry and experience what Sunset Beach is known for…getting blasted by jet wash from departing planes as they take off from the runway that dead ends across the street. I missed the infamous Air France Airbus, so a larger Insel Air and a US Air 737 had to do. I never was sent spinning into the sea but I have to admit it was a bit of a hoot and feeling like a kid again for a few minutes doing something as my friend put “completely stupid” if it’s harmless is never a bad thing in my opinion. Refreshed, relaxed and some sand already in my flip flops, it was time to head back to the airport with plenty of photos and some stories to tell. With boarding passes already in our possession and bags having been checked earlier, we quickly cleared security with time for an espresso before boarding for the final leg of our journey. If you have never been on a 16 seat twin otter before, you are missing one of life’s little pleasures unless of course you are an extremely nervous flyer. This was not mine or my family’s first time on one of these but the thrill was as if it was. The tight quarters and limited carry-on space is not so pleasant, nor is the heat while you are waiting to take off, but Win-Air is very organized and by the time you are boarding, the baggage is already loaded and most pre-flight checks completed by the crew. The few minutes you are on the ground, it is part of the charm to provide yourself with a little relief with one of the fans provided in your seat back pocket! 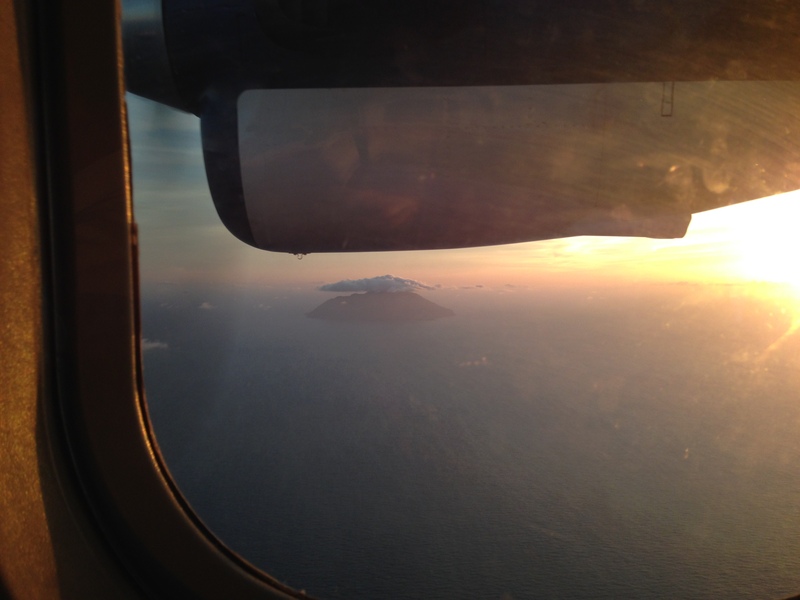 Once in the air, the cabin was cooled almost immediately and I soaked up the 18 minutes in the air as we past various mountainous green islands speckled in the turquoise ocean below. Taking photos with my I-Phone (as that is all I had kept at hand for this flight) simply couldn’t capture the majestic views of our sunset flight. You will simply have to take my word for it, but the images are burned in my mind and to me this is enough. 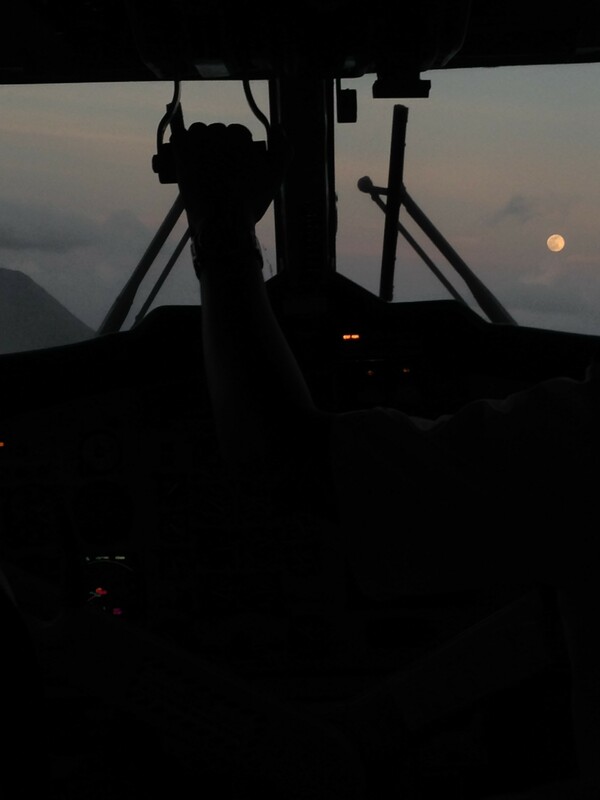 As if to add to the magic of our evening flight (640pm departure from St Maarten with a 700pm arrival time in Statia), the moon rose in the air along with us and by the time we landed was in full glorious display through the cockpit window which was just a few feet in front of where we sat. Just as I thought my photo opportunities had come to an end, I cleared immigration (a grueling 5 minute process at a small desk) snapping a few shots of Statia’s airport tower (a small yellow 3 story building with curtains in the windows) along the way. 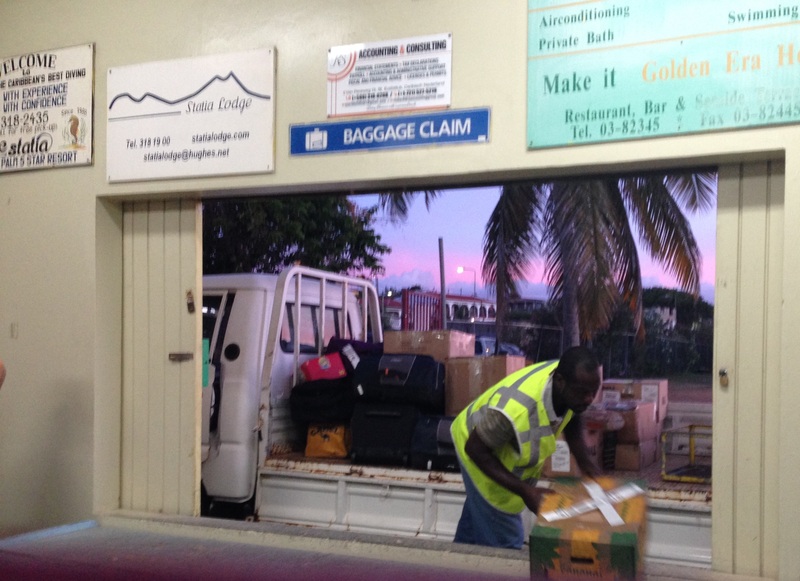 Statia airport had one last treasure in store for a travel-geek like me…luggage claim! Literally a few steps from the Immigration Counter sits a large open “window” with a long wooden block underneath. Here I watched with great amusement as our bags were gently passed through the window and laid on the block ready for our retrieval. For some, 3 flights and all day itinerary is enough to put them off traveling to a particular place and I can understand it, but I have always been a believer that life is not about the destination but the journey and I try to embrace life’s inconveniences as a life experience wherever possible. Today the getting there was not something that had to be tolerated – it was thoroughly enjoyed. As we made our way to the airport exit (steps from our lovely little luggage claim), I didn’t realize the big grin I had on my face until my son said “you are in love with this place already aren’t you?”. “Yes” I replied without hesitation…Yes, I am.